Introduction: Patients utilize the Internet to obtain information regarding bariatric surgery. The quality of this available information is inconsistent. Specifically, many patients browse video sharing websites to further educate themselves about the procedures. This study tested the hypothesis that a common video sharing website would provide high quality information for bariatric surgery patients. 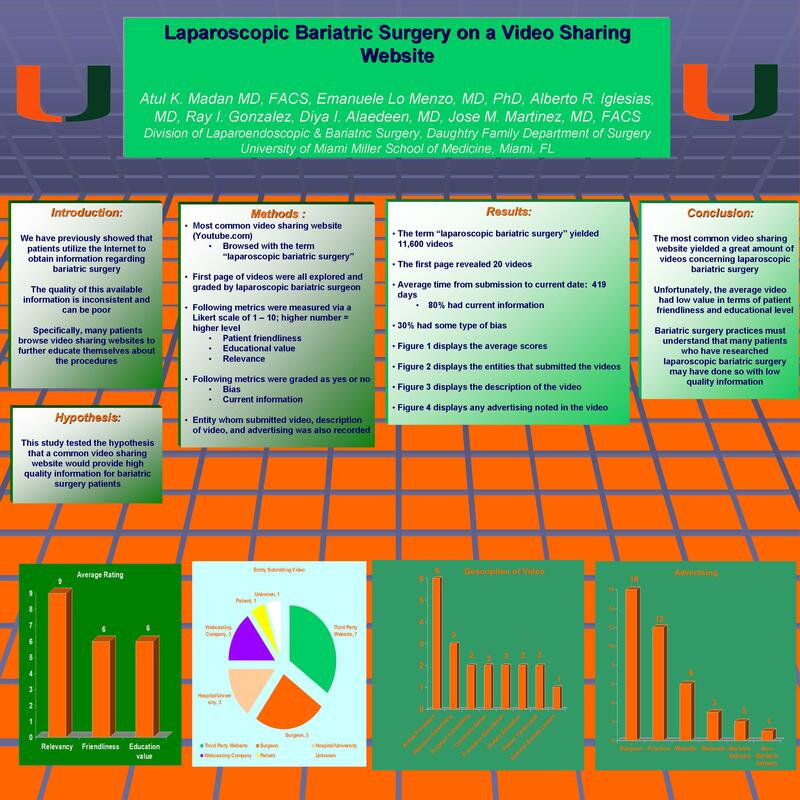 Methods: The most common video sharing website (Youtube) was browsed with the term “laparoscopic bariatric surgery”. The first page of videos were all explored and graded by laparoscopic bariatric surgeon. The following metrics (via a Likert scale of 1 – 10) were measured: patient friendliness, educational value, and relevance (higher number = higher level). Bias and current information were graded as yes or no. Entity whom submitted video, description of video, and advertising was also recorded. Results: The term “laparoscopic bariatric surgery” yielded 11,600 videos. The first page revealed 20 videos. The mean relevancy was high (9) but the patient friendliness and education level value were both relatively low (6) and 30% had some type of bias. The average time from submission to current date was 419 days; yet 80% had current information. The list of entities that submitted the videos included third party website (7), surgeon (5), hospital/university (3), webcasting company (3), patient (1), and unknown (1). The descriptions included Video of procedure (6), webcast advertising (3), program advertising (2), university series (2), procedure description (2), dietary education (2), patient testimonial (2), and National Society lecture. There was obvious advertising for the surgeon (16), practice (12), website (6), webcast (3), bariatric industry (2), and non-bariatric industry (1). Conclusions: The most common video sharing website yielded a great amount of videos concerning laparoscopic bariatric surgery. Unfortunately, the average video had low value in terms of patient friendliness and educational level. Bariatric surgery practices must understand that many patients who have researched laparoscopic bariatric surgery may have done so with low quality information.